This is rare for me to write a stream of consciousness narrative without much editing. I love editing, but we’ll try this experiment, with the blog hop theme of “mb” to include the letters mb together or to use them as a topic for inspiration. The host of this blog hop is Linda G. Hill. Amber – it’s a name but also a type of gem, although it’s not truly a gemstone. I was so surprised to find amber from the Baltic Sea at the Maui Swap Meet last month. This is the opposite place on the earth as far as I’m concerned, from Hawaii. The proprietor of the amber booth still has family in Lithuania or Latvia and they ship her quality pieces of amber. The Baltic Amber booth at the Maui Swap Meet. I was thinking about cropping this photo but decided it violates the spirit of stream of consciousness writing to edit a photo! LOL. This amber booth is next to the Maui Christmas booth. She can make a decent living working on Saturdays at the Swap Meet. I don’t know if this is totally true, but suspect it to be since there is so much foot traffic at the Swap Meet and she has an extensive booth with many items for sale. To find such an extensive selection of Baltic amber on Maui. It was mind-blowing, and I may exaggerate, but I haven’t seen this much amber since living in Russia years ago. Amber was very common there and I bought an amber necklace and ended up later giving it away. In case you are not familiar with amber, it’s a honey colored resinous rock formed from hundreds of thousands of years of geological processes in which the resin from a tree hardened and was submerged in the ocean. Tons of Baltic amber is found along the shores of the Baltic Sea each year, as the sea movements or currents uncover and move the amber to the surface. Now, I’m not an expert on amber so don’t quote me – there may be some inconsistencies here. Some amber has insects or bits of other materials trapped inside. Think of Jurassic Park with the amber that had dinosaur DNA inside. In my bizarre stream of consciousness, I am now thinking of the place that supposedly has the island filmed in Jurassic Park, which I believe is the Garden of Eden in Huelo, about 10 miles from my house. I haven’t been there yet. It’s like living in New York City and never visiting the Statue of Liberty. Actually the film was not filmed on Maui, it was mostly filmed on Kauai, as I recall. But one opening scene with an islet in the backdrop – I’m pretty sure that was on Maui. The amber lady also had rough chunks of amber as well as polished pieces. She confessed to me that she preferred the uncut and rough amber, in its natural and unfinished state, to the polished and shiny pieces. The amber book explaining the origins of amber, along with large pieces of amber in its natural, raw state. Since I am deliberately NOT editing this photo, except for adding a watermark, you can see a person's toes in the bottom of the picture. Presumably it's a woman, wearing pink toe nail polish and slippers. Elsewhere they are called thongs but in Hawaii, we call them slippers or slippahs. They are the most popular footwear in Hawaii. Even for weddings. Yup. I had met another woman from Latvia recently, who has lived on Maui for decades and has stories of surviving WWII, as well as stories of living in the jungle in Huelo and climbing over thickets of woven branches to visit the next jungle hut in the next clearing. It was so thick that the only way she could get to her neighbor was to climb over the trees instead of walking on the ground! Keep in mind, this is a SOCS, stream of consciousness piece similar to the rough hewn amber in the amber booth at the Maui Swap Meet. Unvarnished, natural, uncut. Not my normal style, but I’m open to new ideas. Is one more beautiful than the other? Is the polished prettier than the rough? Is the shaped piece better than the raw? Or is it just what one feels at the moment? 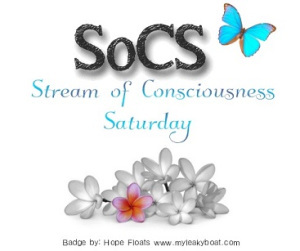 If you want to join, the Stream of Consciousness Saturday post is hosted here.